Lawrence Gymnastics & Athletics offers competitive gymnastics teams for athletes. While the majority of our students never compete in gymnastics many do and we offer choices that will allow them to pursue their desired activity. After girls and boys have mastered required skills sufficiently, they will be invited to join our completive team and go to low-keyed local competitions. 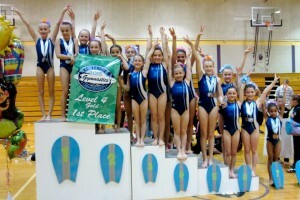 At the lower levels (Level 3&4), we compete in local AAU/League meets with lower costs. As they advance, girls and boys have the opportunity to compete in USAG competitions (Levels 5-10). These teams are “Invitation Only”, and placement is only made after students are evaluated. Parents of athletes on the girl’s and boy’s teams are required to join and actively participate in Lawrence Gymnastics Boosters Club organization that supports the teams.